From now to May 19, 2019, you could get 50% bonus when you buy Alaska Mileage Plan Miles (>40000 miles). 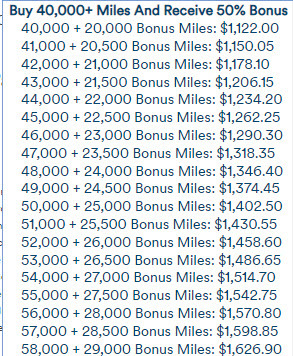 Note: Miles are purchased from Points.com Inc. A 7.5% Federal Excise Tax, and GST/HST for Canadian residents will be applied. Miles are non-refundable and do not count toward MVP and MVP/Gold status. Offer is subject to change and all terms and conditions of the Mileage Plan Program apply.